Information I had intended to pass on to you, however, is too important to your survival for me to ingore our meeting in good conscience. It is for this reason that I am putting my suggestions down in writing, so that you might gain the benefit of my hard-won wisdom and hopefully survive long enough for us to meet again in the future." 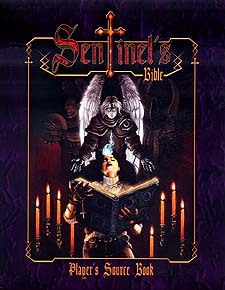 The Sentinel's Bible is a tool to aid the Chosen Elect in their battle. The pages that lie ahead shed light on the nature of the war against the Legion, and hint at the enemy's movements during the Time of Uncertainty. They introduce invaluable wisdom on what it means to be a soldier of God, and the pitfalls that the holy warrior will face along the way. The life of a Sentinel is a tragic one, and embracing this truth enhances its potential to create memorable and lasting Prophecies. * Chapter One: The Tragic Hero details the qualities of what it means to be one of the Chosen Elect from a classical storytelling perspective. * Chapter Two: The Chosen Elect introduces new Backgrounds, additional Benefits and Detriments, and new Celestial Orders to further individualize each Sentinel. * Chapter Three: Grace Exalted delves into new Celestial Divinities for Jeremiel, Raguel, and Suriel, and the Heavenly Divinites of Afflict, Genesis, and Omen plus more detail on Places of Power. * Chapter Four: Time of Uncertainty brings the world to life with Sentinel accounts of the horrors that are taking place across the globe, and includes a definitive guide on understanding the symbolism that exists within Prophetic Revelations. * Chapter Five: Legion Bane arms the Chosen Elect with the powerful rites of Exorcism, the Seven Sacraments, and Artifacts of Antiquity, including the Spear of Destiny, and the Ark of the Covenant. * Chapter Six: Brothers in Arms invites new soldiers into the war against the Legion in the form of the Jesuits, Chaldean Magi and Martyrs, all of whom have their own strengths and weaknesses to aid the Chosen Elect in fulfilling their destiny.